Background & Objective: The inhibitory effects of four series of aryl butene derivatives, active against breast cancer, on the monophenolase activity of tyrosinase, in melanin-free ink from Sepia officinalis, have been studied. Hydroxytamoxifen 1, ferrociphenol 17 and several aryl butene analogs have shown strong antiproliferative activity on hormone-dependent and hormone-independent breast cancer cells and were evaluated in leukemia K562 cell proliferation. Their potential to induce skin depigmentation by evaluating their anti-tyrosinase activity was also estimated. In order to better rationalize the tyrosinase inhibitory action and the binding mode of the compounds, docking studies were carried out. Conclusion: Hydroxytamoxifen and some aryl butenes showed strong antiproliferative effects against K562 cells at 1 µM without showing tyrosinase inhibition. 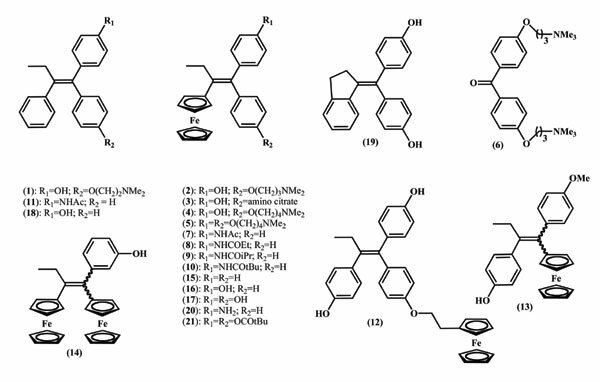 If phenolic compounds 16 and 17 showed the best antiproliferative activity on K562, Hydroxytamoxifen and compounds 5, 10, 20 and 21 have been identified as candidates for further development against chronic myeloid leukemia (CML), and are predicted to not induce depigmentation of the skin, a side effect encountered with imatinib, conventionally used for the treatment of CML. Anti-tyrosinase activity, aryl butenes, chronic myeloid leukemia, ferrociphenol, hydroxytamoxifen, imatinib, skin depigmentation.